Gloom, is probably too cheery a name for a game that takes place in a world where “the sky is gray, and the tea is cold, and a new tragedy lies around every corner.” I picked up this game because the gimmicky design hooked me, so I had to give it a try. Overview – The context of the game is this: Players choose a family to take control of, and the belief of these families is that the more one suffers in this life, the greater the reward is in the sweet by and by. So players take turns playing cards on their characters that will cause them to suffer, thus giving them negative Pathos Points, and then ultimately play a card triggering their untimely death. Meanwhile opponents attempt to play modifying cards on each other that will cheer them up! End Game – The game is over when a player has successfully made all 5 of their family members as miserable as possible, and then killed them off. The player whose family has the lowest total self worth, wins. I guess. It’s kind of like miniature golf in that regard, everyone is miserable and the lowest score wins. You Said Something About a Gimmick? – Yes, yes I did. 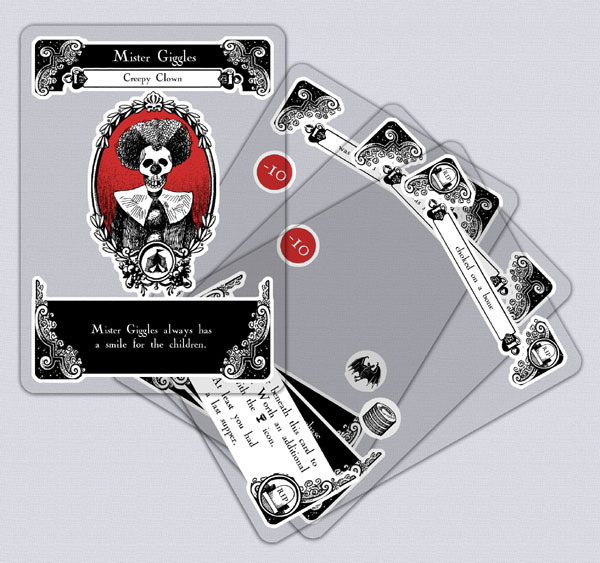 The game is printed on plastic, see-through cards. So instead of stacking up modifiers underneath or next to a character, you actually place modifying cards on top of the character card. These modifying cards have 3 different locations in which they can add or subtract from your Pathos Points; playing certain cards may cover up points or add to them depending on the location. It’s very cool looking. However we found it very hard to read the cards on a darker table top, so we used blank sheets of printer paper as a play mat for each player, and the cards popped right off the table! There are also “Story Icons” on some cards, which add some card synergy to the game; having matching icons will again add or subtract Pathos Points and again these can be covered by other icons or just blanked out completely. Well… Did You Like It? – Yes. And, no. The game designer, Keith Baker, really put out a solid effort on this one. The game plays pretty well, the mechanics don’t feel gimmicky even though they could easily let the clear cards be the selling point. It’s strategic and competitive, but beyond that the flavor text included in the rules goes great distances to ensure that the game is more than just laying small rectangular pieces of see-through plastic on the table. There is a somewhat lengthy description of the “world of Gloom,” as well as the families players can take control of. And further still players are encouraged to story-tell during game play. So instead of simply playing a card and saying, “Okay, so that’s minus 15,” you’re encouraged to play your card and explain that your character “Was out late one night and made a poor decision to order the Pu-Pu platter at the Chinese Restaurant and therefore was – Distressed by Dysentery – giving him negative 15 points!” This is great. And can be fun and entertaining with the right players in the game! The aspect of this that doesn’t ring true with me is that there are cards that become a little too gloomy for my taste: Chastised by the Church, Pestered by Poltergeists, Hunted by Horrors, etc. The game is intended to be cartoony and humorous in a dark way, but in some ways, for me, it gets a little too dark at times. Of course, I don’t know what else one would expect when a game’s goal is to maim and kill your own characters. The End – Since its release Atlas has added 3 expansions, each of which adds a family, and therefore the ability to add players to the game. The game plays well, but raises many flags for me on the content side of things; tread carefully with this one, or check it out at your local game shop before picking it up! Am I way off on this? I’d love to hear your opinions and experiences with Gloom, leave them in the comments below! And as always, thanks for reading! Gloom is on Amazon if you dare!